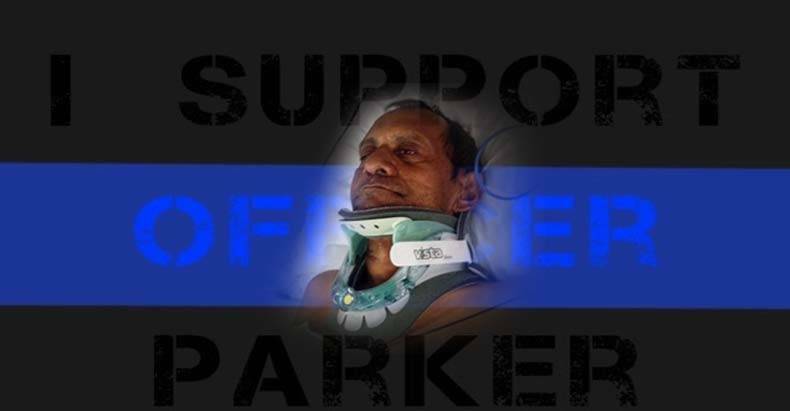 Madison, AL– An online fundraiser for Madison police officer Eric Parker, who is facing charges of third-degree assault after brutally attacking 57-year-old Sureshbhai Patel, who does not speak English, has raised over $3,000 in only three days. The campaign- that has currently been shared nearly 600 times on Facebook, has a goal of $10,000 and 28 days left to reach it. When police arrived to unjustly harass him, he could not understand their commands or what the situation was. This resulted in the barbaric Officer Parker throwing him face first into the ground while holding his hands behind his back. Patel was left temporarily paralyzed and hospitalized with fused vertebrae, all because he could not understand what the officers were saying to him. The man had simply been out for a walk and had committed absolutely no crime to warrant being approached, let alone assaulted. The department has publicly apologized to the family and arrested the officer. He was freed the same day on a $1,000 bond. Who in their right mind can watch the dashcam video of this incident, and somehow think that officer Parker is the victim? Are people so blinded by the blue line that they cannot see a criminal act when it is explicitly captured on video and shown to them? Patel remains hospitalized and partially paralyzed, but is showing signs of improvement. He is currently in the process of being transferred to a rehabilitation center. “His grip strength is improving, though he can’t yet handle small objects (like a spoon). His legs are improving, too, particularly his right leg. The doctors attribute the improvement to Mr. Patel’s hard work and motivation.” Hank Sherrod, the family lawyer, has stated. Patel is expected to incur over $250,000 in medical bills and does not have any form of health insurance. Thankfully, humanity is winning out, and a fundraiser launched for Patel has already raised over $167,000 from nearly 4,000 people in only four days. Patel’s lawyer has issued a statement to the Hindu American Foundation verifying that all proceeds from the Go Fund Me will be used solely for medical expenses and related issues and not for any legal fees. The fundraiser has received donations and well wishes from donors around the world, with many American’s expressing their shame and embarrassment that this could happen to a guest here. “The treatment received is without excuse. So sorry for your bad experience in America. As you can see, we have a problem with ‘out of control’ police. Maybe, just maybe, this will open some eyes to that problem. Hoping you have a complete recovery.” one donor named Howard Mciay wrote. “I am shocked by this poor example of true American hospitality. We (the masses) are caring, kind, loving human beings who are all praying for you and your family.” another donor named Jonathan Hart wrote. Donate to Sureshbhai Patel’s medical expenses here.